Something happened yesterday that didn't register until about 10:30 in the morning. As you know, I get milk delivered. This is yesterday's delivery. Normal weekly delivery is one half gallon of milk, one 2.5 gallon container of water. I added one deep dish Connie's sausage pizza. It's new on the menu. One of the symptoms of RA is the gradual loss of upper arm strength. I've spoken of how opening jars became impossible. Well, carrying things also became a chore, and, in some cases, a worry. 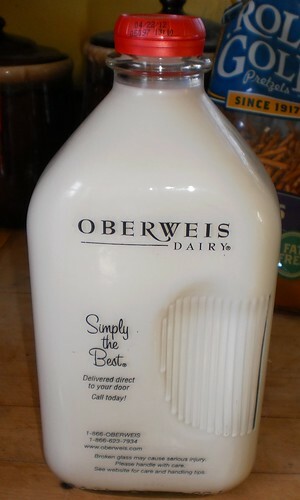 I open the milk box, grab the bottle around the lid, lift and carry it into the kitchen. In the past, it was a one-handed chore. Gradually, over the course of last year and on into winter of this year, I lost the ability to carry things one handed. Anything over 4 pounds had to be a two-handed lift and carry. I never dropped anything but I was so unsure of my ability to carry it, I figured two hands were better than one. I seriously considered cancelling my milk delivery because I was afraid I would drop the bottle on the way to the fridge. These are heavy glass bottles. They shatter. Yesterday, I opened the box, grabbed the milk, walked to the fridge and put the milk on the shelf all while carrying the bottle with my right hand. It was so natural a movement, something I've done for close to 20 years, that I didn't realize what a milestone this was until mid-way through the morning. Euphoria. I had to tell everyone in the office. We were in the middle of mandatory safety and job training, but I was, and still am, thrilled. I still must be careful and not overextend myself simply because I think I can do it. This is a great milestone in recovering my life.